Think about your first cup of coffee of the day. Whether it's a drip mug at home, a Starbucks cold brew on the way to work, or a fancy pour over from the hipster shop down the road, coffee is the beverage that gets us through the day. With the increased popularity of high-end coffee over the past several years, you'll see more and more companies moving toward the nebulous idea of subscription coffee. It's a relatively new pricing strategy for such a commoditized product, but the subscription economy is making its mark here as well. 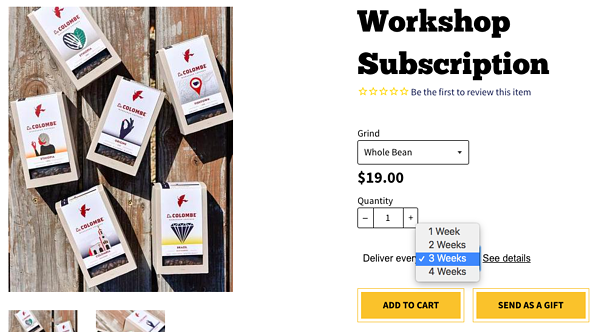 In this week's Pricing Page Teardown, we dive into what makes a good subscription coffee service and take a look at a few brands that are finding success in the market. When it comes to selling subscriptions for a commoditized product, it's important to really make sure that the customer knows exactly what they're getting into. Do you really know how much coffee you drink every week? For many of us, Peter and me included, delicious coffee is the fuel that gets us through the day. When you take a look at a few different brands that offer this kind of thing, it's easy to see that brands should be thinking about frequency instead of subscription. La Colombe offers subscriptions on everything from beans to their premade canned lattes. 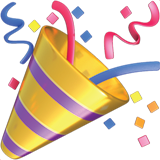 You have the option of delivery every week, biweekly, every three weeks, or monthly. Blue Bottle, one of the first to find success with the coffee-subscription model, takes a slightly different route, offering smaller quantities for their weekly subscription and scaling up from there. 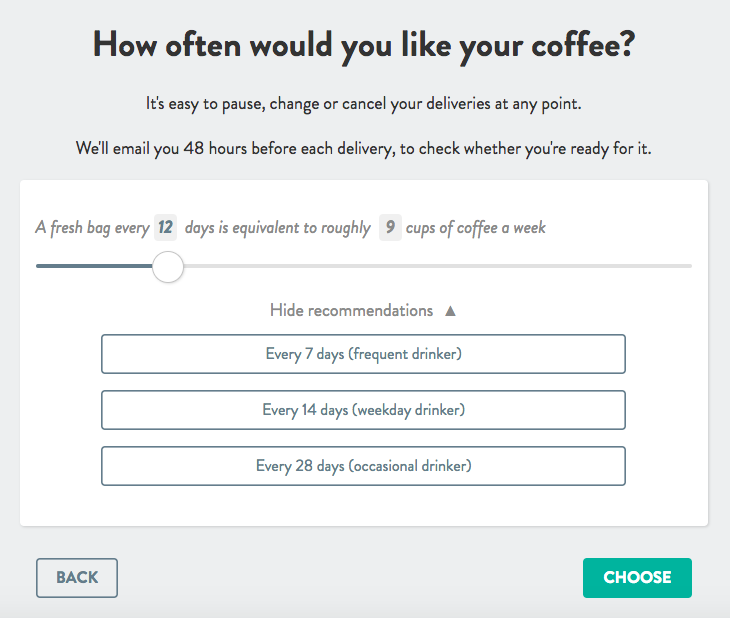 While these are both very good options, we found that Pact did a great job of using site design, making it easy for their customers to see just how much coffee they need for the subscription. With a handy slide-bar that shows approximately how many cups per week a fresh bag will make, Pact was able to nail down the most difficult decision for their customers right away. The company found that framing the subscription based on how frequently their customers drink coffee was the best way to make it clear what package they should choose. We surveyed 10,088 current coffee drinkers and found that the monthly willingness to pay increased as the drinking frequency decreased. This is super interesting because it shows how people think about coffee differently, based on their intake. 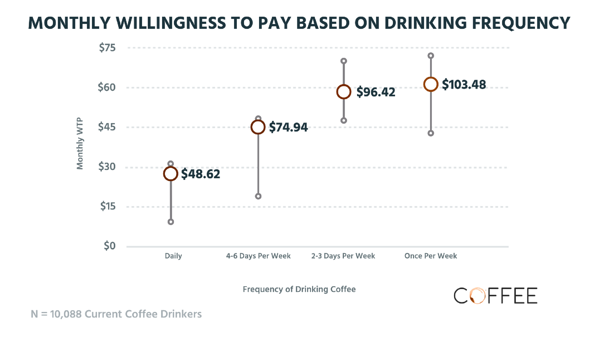 For daily drinkers, we see a willingness to pay $48.62, whereas someone who only drinks coffee once per week, willingness more than doubles to $103.48. The once-per-week drinkers see coffee as more of a luxury item. Daily drinkers don't want to shell out as much for their coffee since it's more of a routine or habit. The jump between four- and six-days-per-week drinkers and two- to three-days-per-week drinkers mirrors this increase as well. At around $48, the low end of willingness to pay for two- to three-days-per-week drinkers is at the high end for four- to six-days-per-week drinkers. Finding a way to match the right kind of subscription with the customer will be very important for these companies moving forward. With a product that is so personal to each customer's habits, the market needs to find a way to provide a subscription that hits the right frequency. Too much coffee too often will go bad, and too little coffee infrequently will lead to dangerously undercaffeinated customers, with each situation being capable of damaging the overall customer experience. Positioning and packaging is really important when you're going for a subscription model in a commoditized market. La Colombe, Blue Bottle, and Pact have all done this to some degree by going niche with their products. Whether it's country of origin, ethical considerations, or even caffeine content, each company has found a way to package their product in a way that distinguishes them from their competition. We even see this kind of thing in Starbucks. They're targeting different markets with niche products, like the Unicorn Frappuccino, which brings in a new group of customers who are not interested in coffee directly. Looking at the feature preference of the 10,088 current coffee drinkers we surveyed, you can see what kinds of things are differentiating, and it might not be what you think. We found that things like the smell and the body of the coffee were Core Features instead of alongside taste as a Differentiable Feature. Customers are likely to pay more for the taste, and even caffeine content, but the more nuanced aspects of the coffee are just expected to be there. Both Blue Bottle and Pact use the flavor profiles of their blends to highlight specific tastes they find in their coffees. Pact differentiates a bit further by adding a “Roast Profile” for customers who are looking for something on the lighter or darker side. There's also a brand called Death Wish Coffee that's marketing its coffee as the world's strongest, in terms of caffeine content. The Add-Ons section is where we really see some interesting trends. 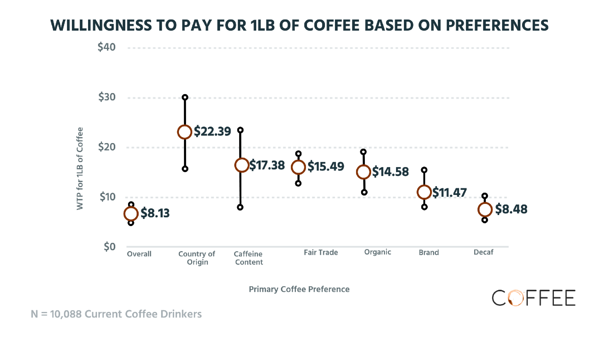 The willingness to pay for single-origin coffee is much higher—almost 200%—whereas Fair Trade and organic both sit around the 100%-increase mark. The coffee's provenance is really what people are expecting to pay more. Blue Bottle, Pact, and La Colombe all do this on their sites, listing the country of origin for each type of coffee they offer. Where Blue Bottle offers organic coffee to differentiate themselves, Pact and La Colombe do not. What's interesting is that all three do not list their coffee as Fair Trade either, but they do have information on how they pay their farmers. 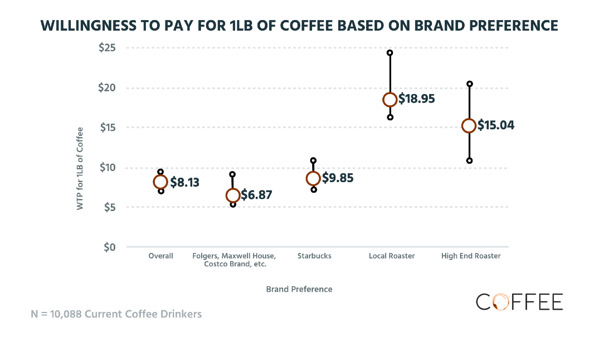 We see this reflected in the willingness to pay for one pound of coffee, based on preferences. Our survey participants are more willing to pay for country of origin, at $22.39 on average, up to $30. The $8.13 overall price you see here is the commodity price for one pound of coffee. 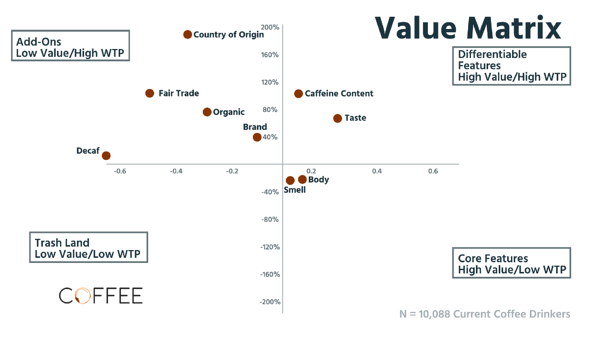 We saw this in the Value Matrix as well, but people aren't all that interested in decaf. It has a low willingness to pay and preference. You get a slight bump for brand, at $11.47, then organic, Fair Trade, and caffeine content are around $15, give or take. Niche features like country of origin and caffeine content are still seeing the biggest willingness to pay, which is why it's so important that each company is positioning and packaging their products to a specific customer or persona. 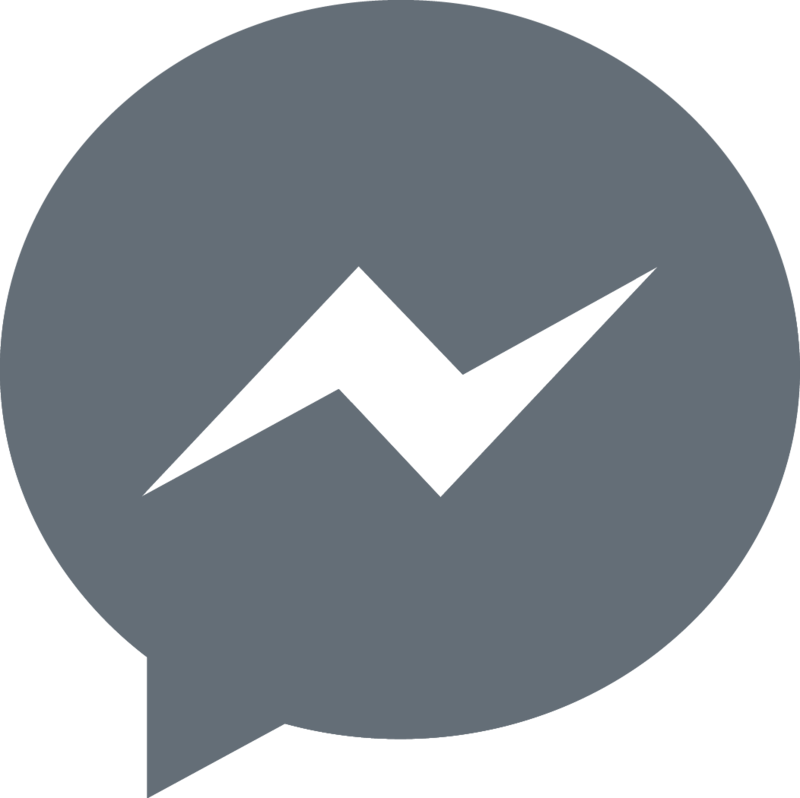 When we dive a little deeper into brand preference, you can see this niche and exclusive idea coming through as well. You have your store-brand, Folgers, and Maxwell House people on the super low end, at $6.87 a pound, and local and high-end roasters at the other. The bump for local roasters is cool to see and compounds on the idea of niche packaging as well. People are willing to pay up to $25 a pound for local coffee as opposed to $20 for the high-end product. That's more than double what our survey participants are willing to pay for Starbucks, et al. The idea that brand preference by some but not others translates to a higher willingness to pay just adds to the idea that packaging is important when going after a specific area of the market. Blue Bottle and Pact are pretty much in line with their pricing, in the $16 to $20 range, but La Colombe could come up for some of their single-origin products, many of which are coming in under the $15 mark. Finding a way to use add-ons as a way to boost the brand and boost ARPU is how companies are going to be able to compete in these commoditized markets. It's difficult with a physical product because there's also a large part of the experience that is based on the customer's preference and subscription timing, but finding ways to settle into a specific niche can help boost your growth. La Colombe offers up a line of canned coffee drinks as a part of their subscription. 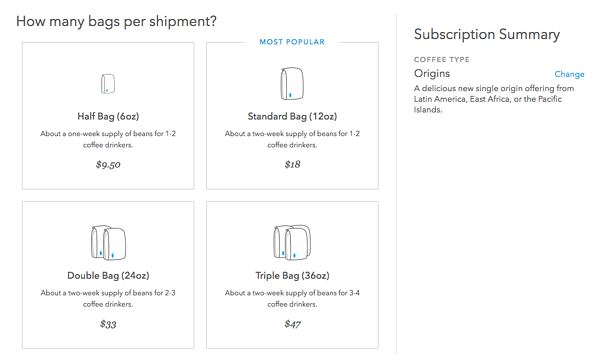 Blue Bottle gives their customers access to smaller amounts shipped more frequently. Pact is refining the customer experience in an effort to provide more accurate timing. Each is working on ways to grow their brand and differentiate their subscription from the competition through coffee, a highly commoditized market. By working to refine their individual subscription offerings, each brand is able to acquire more customers that fit their model. With the right packaging and positioning, they are able to find the right kind of customers that can grow the business better.